Kyle shriveled to 140 pounds when a motorcycle crash put him in an upper-body cast. 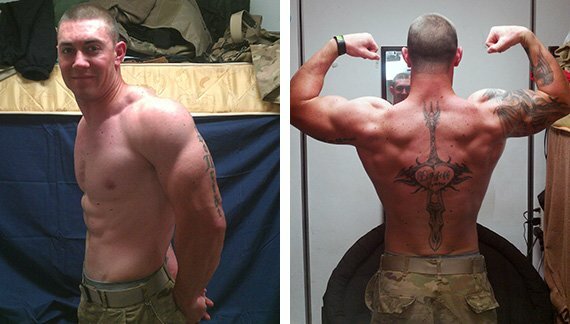 He regained mobility, lifted relentlessly for two years, and built 50 pounds of muscle! I started lifting in high school, but never took it seriously. I was skinny and accepted that my metabolism would never allow me to grow. After high school, I went down an unhealthy path and started doing drugs. I was lost. My mom looked at me one day and asked me if I had been eating because I looked so thin. That sparked something inside me. It was time for a new life. No matter how much hard work and dedication it took, I was ready to see it through to the end. 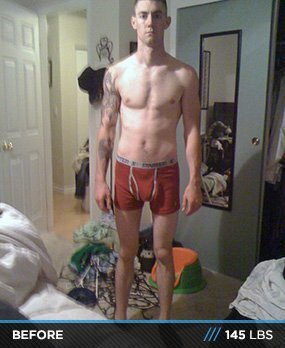 I got serious about lifting in 2007 and was shredded in no time because of my low body fat. I became a personal trainer and sought more knowledge from people I worked with so I could help my clients and myself. I made steady gains and reached 160 pounds. At the time, I didn't think that was possible for me. But my success was short lived. Tragedy struck at motocross practice when I flipped my motorcycle going 50 miles per hour. I fell back and my bike landed on top of me. I fractured two vertebrae and was taken to intensive care, where I stayed for a few days. I was lucky to walk out of the situation, but I was devastated because my hard work was gone. I spent a few months in a full upper-body cast and slowly dropped to 140 pounds. Depression got the best of me. I didn't realize how small I was until I saw a picture of myself. It was a slap in the face. I hadn't come to grips with the reality of the situation because I lived in denial, but it was time for serious change. I took a new approach to lifting this time. I read fitness magazines, watched inspirational movies, and researched new training regimens. I started slow so my body could adapt and my back could handle it. I tried heavy sets with low reps, circuit training, and supersets. I discovered what worked for me and chose exercises that provided the best gains. Most of my training is based around Arnold Schwarzenegger's old plan. He's been my idol since I started lifting and plays a big influence on my goals. My goal is to reach Arnold's competition weight with a similar physique. I limited partying and drinking so my gains would come quicker. It became a lifestyle. If I missed the gym, I felt terrible. I remembered people's negativity toward me and used it as motivation to accomplish my goals. I didn't let anything hold me back. Doubters were fuel and I loved proving them wrong. I started training six days per week, transitioned to two-a-days, and saw insane gains. I never saw progress like this before. It became an addiction. The never-ending search for perfection in a world where you are your worst critic kept me going. I followed the guide called Escape From Hardgainer Hell from Bodybuilding.com. The first three days are heavy weight with low reps and the next three are concentrated on light weight with high reps. I take about 60-90 seconds of rest between sets on heavy days and 30-60 seconds on light days. The hardest challenge was overcoming the back pain initially and taking it slow. Bodybuilding is progressive over time and you don't see results quickly. The hardest part for most people is continuous dedication when results don't come instantly. As a hardgainer, I had trouble watching people around me see good results by using the same routine as me. Working a full-time job, being a parent, and serving in the Army National Guard make it hard to find energy and motivation to work out. To overcome hurdles, I went to the gym with a friend. We pushed each other to the maximum and never slacked. We thrived off our motivation and looked forward to the gym every day. My future fitness goals are to reach out to people around the world and motivate them. Mental weakness and lack of dedication separates the champions from the rest. I hold myself to that and preach it. Hopefully, I become an IFBB pro or higher at some point in the future. Set goals, be patient, and be dedicated. With those three, I believe you can accomplish anything. Set simple goals and set the bar higher until you reach satisfaction or a maintenance stage. Be patient. Nothing happens overnight. Stick to your plan no matter what and the results will show. Be dedicated to your fitness goals and break barriers. Champions aren't born, they're made. 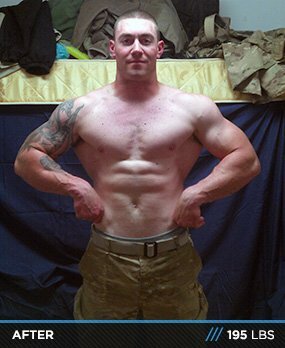 Bodybuilding.com helped my transformation the entire way. The informative interviews, transformation photos, videos, and support and motivation from BodySpace gave me the tools to make it possible. I was deployed in Afghanistan and they managed to get my order to me within 5-7 days every time. No longer content to sit on the sidelines of life, these guys have gone from wimp to pimp! Age is no excuse for these over-40 women & men who have decided to feel and look young again!